SCVHistory.com | San Francisquito | Angelenos Petition Taft to Designate 1834 Gold Site a National Park, 1910. Angelenos Petition Taft to Designate 1834 Gold Site a National Park. We consider the first "documented" discovery of California gold to have been made by Francisco Lopez in 1842 in Placerita Canyon. Years ago, folks weren't necessarily sticklers for documentation like we are today. Oral histories — and even some old textbooks — are rife with stories of earlier discoveries, many of them by Lopez, who by the end of the 19th Century had achieved mythical status. One persistent story involves the supposed discovery of gold by Lopez in 1833 or 1834, probably in San Francisquito Canyon. In 1910, national parks, and more particularly the president's authority to designate national monuments all by himself through the 1906 Antiquities Act, were fairly new things. 17,900 acres would be a nice chunk of real estate, and we don't know what they're talking about when they refer to federally owned land three miles north of Saugus (which in 1910 was measured from the modern-day intersection of Bouquet Canyon Road and Magic Mountain Parkway). They probably mean the mouth of San Francisquito Canyon, where there was a great deal of gold activity, although it's a bit farther than that. Check out the location of the legendary "Gold Bowl." Want Park Where Gold First Found In State. Pioneers Petition for Control of Historic Ground. Los Angeles Herald | June 29, 1910. 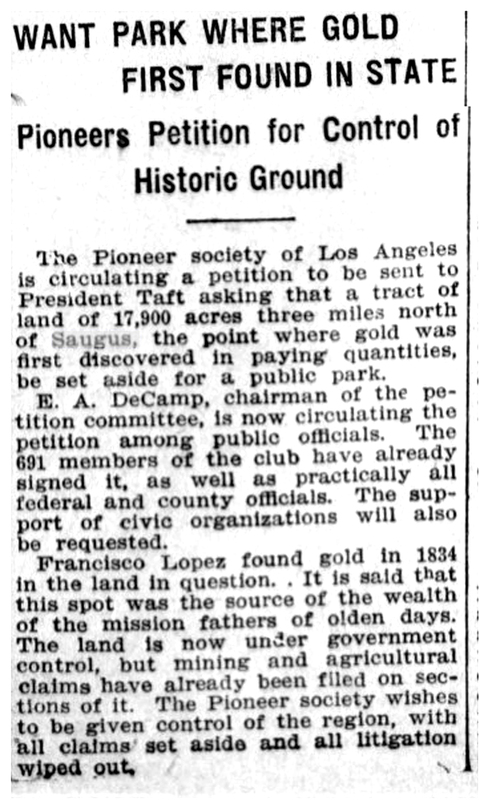 The Pioneer society of Los Angeles is circulating a petition to be sent to President Taft asking that a tract of land of 17,900 acres three miles north of Saugus, the point where gold was first discovered in paying quantities, be set aside for a public park. E.A. DeCamp, chairman of the petition committee, is now circulating the petition among public officials. The 691 members of the club have already signed it, as well as practically all federal and county officials. The support of civic organizations will also be requested. Francisco Lopez found gold in 1834 in the land in question. It is said that this spot was the source of the wealth of the mission fathers of olden days. The land is now under government control, but mining and agricultural claims have already been filed on sections of it. The Pioneer society wishes to be given control of the region, with all claims set aside and all litigation wiped out. 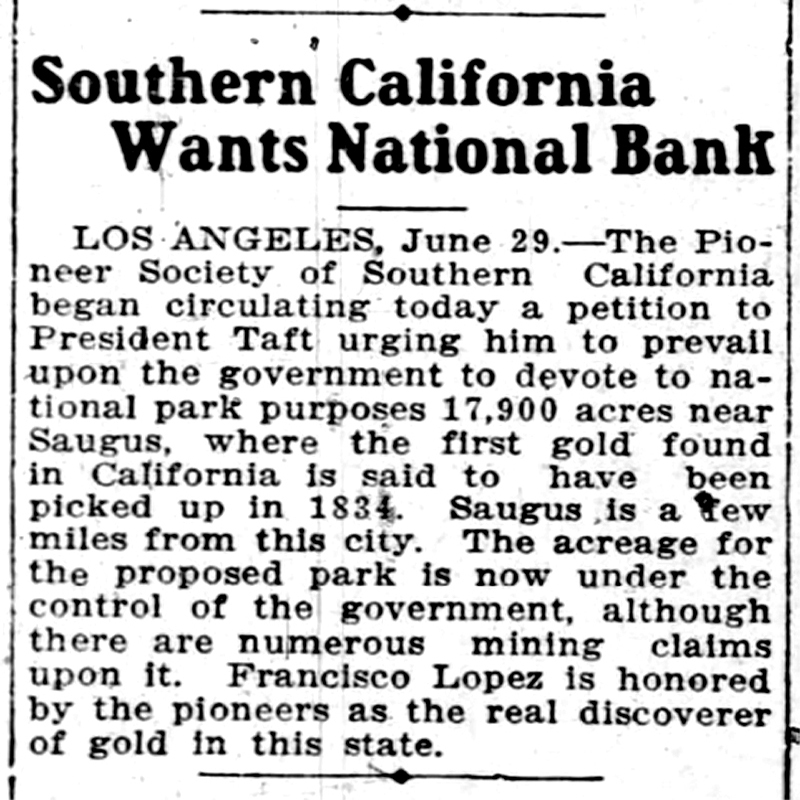 Southern California Wants National Bank [sic; s/b Park]. Oakland Tribune | June 29, 1910. Los Angeles, June 29. — The Pioneer Society of Southern California began circulating today a petition to President Taft urging him to prevail upon the government to devote to national park purposes 17,900 acres near Saugus, where the first gold found in California is said to have been picked up in 1834. Saugus is a few miles from this city. The acreage for the proposed park is now under the control of the government, although there are numerous mining claims upon it. Francisco Lopez is honored by the pioneers as the real discoverer of gold in this state.